A Chinese Long March 11 rocket carrying two Jilin-1 Earth-imaging satellites and two test satellites launches into orbit from the Jiuquan Satellite Launch Center on Jan. 22, 2019. China's first space mission of the year lauched Jan. 11, with a Long March 3B rocket carrying the Zhongxing-2D communications satellite into orbit from the country's Xichang Satellite Launch Center in the Sichuan Province. The satellite will provide transmission services for the country's radio and television networks, according to the China Academy of Sciences. A Chinese Long March 3B rocket carrying the communications satellite Zhongxing-2D lifts off from the Xichang Satellite Launch Center on Jan. 11, 2019. A Long March 11 rocket launched four more satellites for China on Jan. 22, lifting off from the Jiuquan Satellite Launch Center in the country's northwestern Gansu province. That mission carried two "multispectral imaging" satellites with China's Jilin-1 satellite family, according to the state-run Xinhua news service. The new satellites join 10 other Jilin-1 satellites already in orbit to provide "remote sensing data and services for forestry, shipping and resource, and environmental monitoring," Xinhua reported. 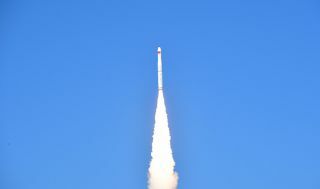 The Long March 11 also carried two other test satellites into orbit, according to Xinhua. They include Lingque-1A, an Earth-imaging and communications satellite prototype built for the Beijing ZeroG Technology Co. for a planned constellation. The second test satellite is called Xiaoxiang-1 03 and is a demonstration unit to "verify radio communication and small remote sensing experiments" for its builder Spacety Co., Xinhua reported. Both launches come on the heels of China's historic Chang'e 4 landing on the far side of the moon on Jan. 2. The solar-powered Chang'e 4 lander and its Yutu-2 rover snapped amazing photos of the moon's far side, and even grew the first plants on the moon before pausing to wait out the 14-day night cycle on the lunar surface.